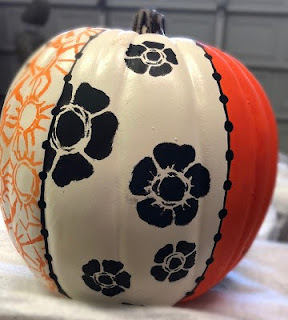 StencilGirl Talk: Pumpkins + Stencils + Original Fall Decor! 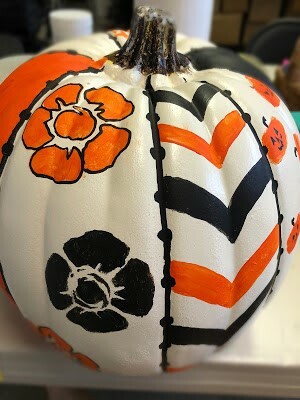 Pumpkins + Stencils + Original Fall Decor! I LOVE this time of the year! The weather is cooling off at night and the colors start to change all around us. It's the time for harvesting and canning for the winter. Its a time for pumpkins, gourds and ornamental corn. 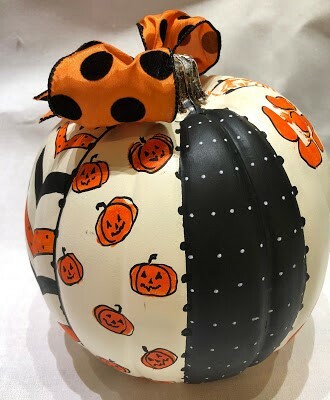 I am thinking early this year so I can get some things on sale, like those white pumpkins at Michaels. I saw something similar to this in a catalog and thought we could make them using our stencils and paint. I hope you enjoy. A white pumpkin, preferably one that is not real from a craft store. I got mine at Michaels. Black, orange and white acrylic paint. Black and white paint pens. 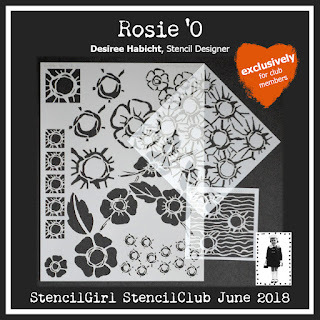 My Rosie 'O StencilClub Stencil Set (a club member exclusive) or your favorite StencilGirl® stencils. 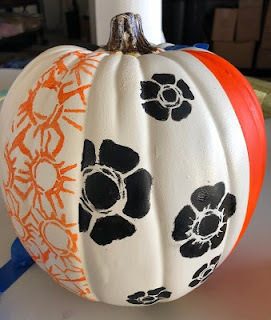 This is a fun way to use some stencils for the holidays. You can do this too! 1. 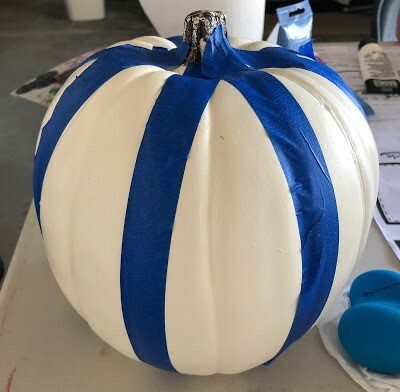 First I taped off some of the sections of the pumpkin. I tried to follow the natural line but that didn't always work. Try to make them similar in size and not too small or your design might not show up well. 2. Next, I begin by deciding which stencil I will put in each section. I used my stencil from StencilGirlproducts© Stencil Club called Rosie O and I am using the 6" stencil first. I pressed it down onto one of the sections and using a dabber or dobber I applied paint with a pouncing motion. FYI - since the pumpkins are rounded it is a bit tricky to hold the stencil down, use tape to help you and I pushed it against the pumpkin to make sure the image was clean. You can clean them up later also. 3. 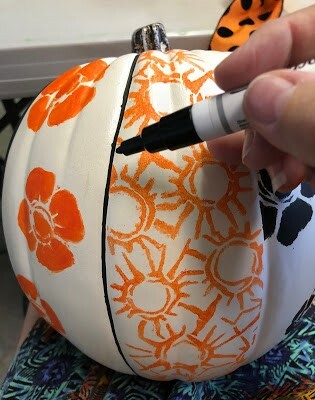 I kept going around the pumpkin using different areas of the stencils to create the look I wanted. As you start to work on sections next to each other you will have to move the tape to get all of the section painted but you will have a nice line to follow. Make sure you don't stencil over the line. 4. After the sections are complete I remove the tape completely to finish up the design. You will notice that they are not all perfect but I will clean them up a bit now. 5. You can use a Q-tip and some water to get off any paint that might have been put down somewhere you don't want it to be. I also used my small brushes to fill in the missing paint. My secret tools are paint pens! I used black and white paint pens to clean up edges and add more designs. Don't these look a bit like spider webs or eyes? 6. I decided to separate the sections with a black line, I like the way it cleaned it up and made it pop. I also added dots later. 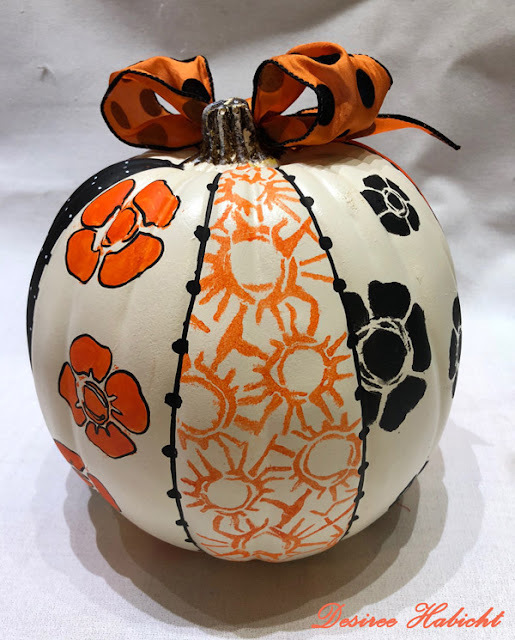 I liked that look so well that I added some black outlines to the flower stencils and details to some of the other sections. Let your imagination go, have fun. A whole section of spiderwebs would have been fun! 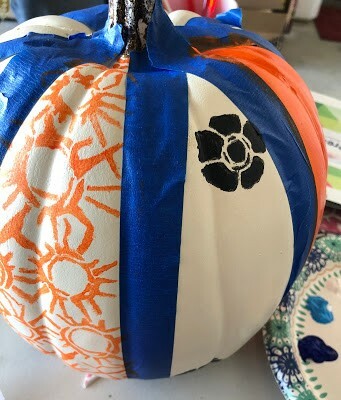 I made these little pumpkins by putting my thumb in the orange paint and then making thumbprints in one section, then added faces. 7. Now for the finishing touches and we are all done. 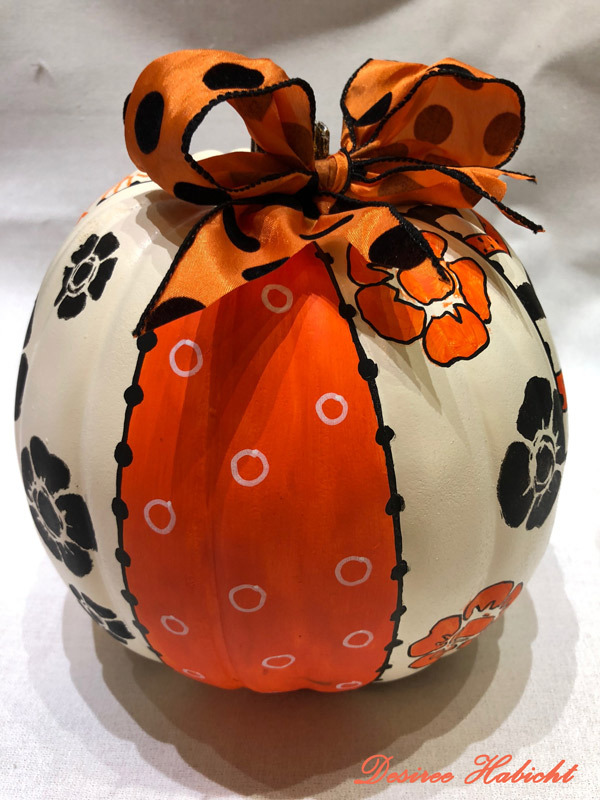 Take a good look at your pumpkin, are there areas where it feels empty? Use your paint pens and add other stencil designs or add something free hand. Circles, dots, and stripes are easy to add with the pens. If you would like them to look like glass you can spray them with a high gloss spray or leave them as they are. I added a bow, which was easily attached with a straight pen or a glue gun. Happy October and Fall!! Have fun designing your own pumpkin this year with your StencilGirl Stencils! Really really cool and very fun. These would make great ornaments too.